Forum Index > Off-topic Talk > Darkwood or Danelli? Posted: Wed 07 Oct, 2015 9:47 pm Post subject: Darkwood or Danelli? 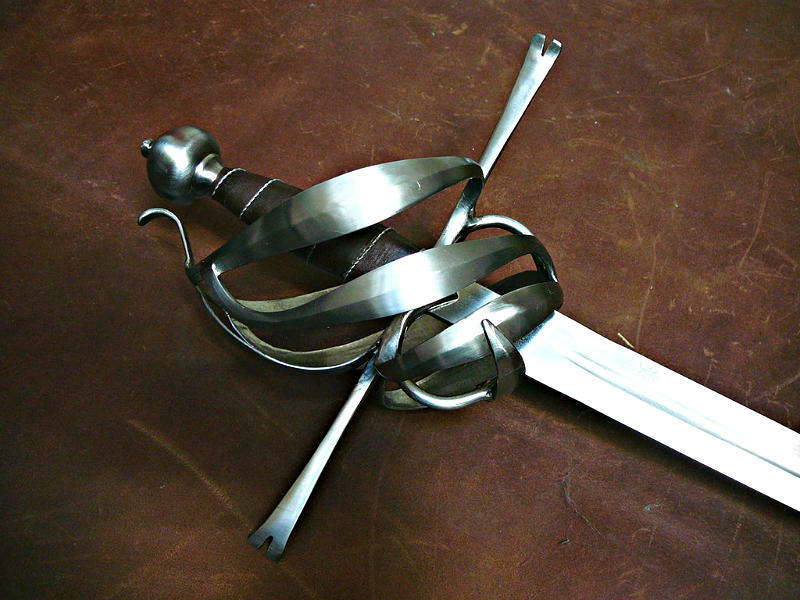 I want my first sword purchase to be a practice rapier and I definitely do not want a Hanwei. I am willing to spend the extra money on a Darkwood Econo Rapier or a Danelli Basic Rapier. I was wondering if anybody had experience with these two and which one I should buy. I am leaning towards the Danelli because I like the cup hilt and the design of the blade tip, but I do not know if shipping it from England will be a problem. I saw an American Website selling the Danelli called Wild Geese Fencing but I was unable to contact them through their site and i do not know if they are still in business and /or have the Basic Rapier in stock. I would greatly appreciate any input or advice from the members of this site. Darkwood armouries I have had experience with , yes. They are very sturdy ,well built weapons and have been a popular choice for historical fencing practitioners for years. The blades are certainly very fine, excellent distal taper, flex, finish,etc. The hilts tend to not capture the subtle elegance of some of the higher costing swords, especially from the economy line. Are you looking for a more lightweight, closely balanced sword, or something weighted more like an original rapier? Darkwood offers their 'bated' rapier blade to simulate the heavier, stiffer and more historical style of weapon. Otherwise, their standard rapier blade is very good. Danelli is much less popular here in the United States, but I regularly examine their products online, and they do seem very fine as well. The shipping from Europe would indeed be an extra inconvenience. Several fencers in my academy have purchased Castille economy rapiers and they are fantastic weapons, truly one of the best value for the cost that I've seen yet . Danelli quoted 280 pounds for the cost of the Basic Rapier plus shipping, which puts the price at about $430.00 USD. What worries me is whether I have to pay import duties on top of that amount. That's why I would like to know if anybody had any experience with Wild Geese Fencing, which sells the basic rapier for $400.00 and ships from the US. I would hate to place an order on a defunct website. Regarding the Darkwood, I would like to know if the rapier blades are interchangeable with all of the rapier hilts, that way if I start with an economy rapier, I could possibly upgrade to a nicer hilt and keep using the same blade. If it is too much trouble to get the Danelli, I will probably buy a Darkwood by default, but I do not think I would be disappointed based upon all of the positive reviews I have seen. 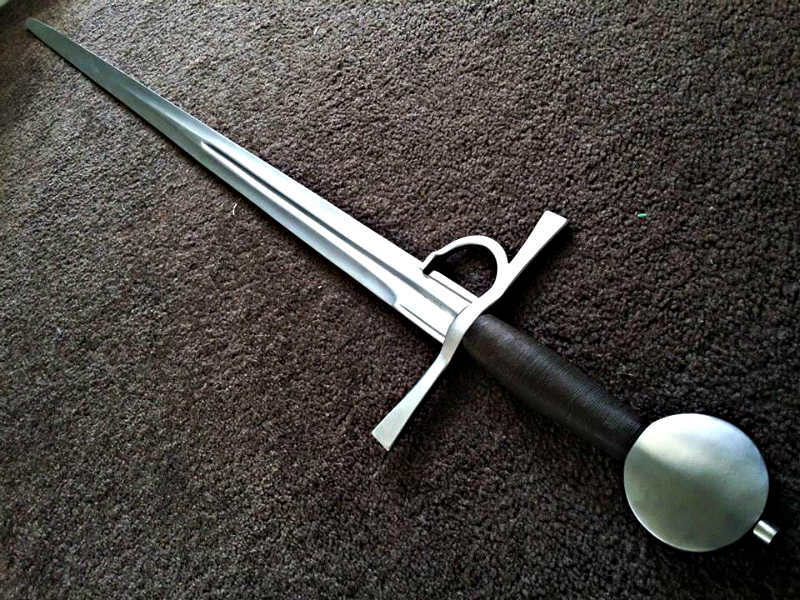 I just ordered the Danelli Basic Rapier from Wild Geese Fencing. I should have it in about a week. Please let us know what you think of that Danelli sword. Their photos look very attractive. I wonder if their functionality matches their looks. Danelli's swords are very widely used here in the UK. Every fencer I know with one of his rapiers is incredibly happy with it. I'd not hesitate to order one if I took up the rapier or sidesword. After watching some Guy Windsor videos on YouTube, (I have also ordered The Duelists Companion) I did some dry handling and the sword feels very well balanced, and works well with or without the cup. The blade is stiff, but it does flex at the end when thrusting into a target. The 5 mm button tip easily thrusted through a cardboard box, so I will probably need to put a substantial tip on it. After I learn more I will give more detailed observations, and I still want to get a Darkwood or a Castille blade in the future so maybe I can do some side by side comparisons. Unfortunately there are no HEMA / WMA clubs or schools nearby, so I may have trouble finding a partner. Maybe when I get Another sword and some protective gear, I will recruit one of my friends to spar with me. I had gotten myself a Darkwood Armory sidesword blade in a rapier hilt last year. I had a few gripes with it. 1. It was very crudely made. The (soft) hilt elements were welded together sloppily and very unseemly, polish was rather bland, so I'd recommend against their "bright" finish and opt for the budget finish. The blade was rather thin at the edges, had a slightly thinned out section around its halfway point and wasn't perfectly straight either. I do not think the product I got was representative of their work overall as they generally have a positive reputation. 2. It broke after ten outings in four months at the threaded end of the tang. Sent it back, was refunded the full price, and thanks to fortunate currency value changes I even got the shipping costs back. No hard feelings. Again: I do not think the product I got was representative of their work overall as they generally have a positive reputation. It did, however, feel great in use. Comfortable to grip, quick to move around, offering ample protection to the hand. Earlier this year I had ordered two pieces by Marco Danelli. One was a straight I:33 fencing sword with minor alterations from his standard design for my wife, and a very (very) special long sword with a basket similar to type J in the schiavone feature (was on facebook recently). We did not have the chance to put them through their paces properly mainly due to health issues, but both feel really nice. The I:33 is well balanced (realistically) and of pretty low weight for its size. The long sword is not exactly light, but a 105cm blade with a protective basket and a 32cm handle length doesn't really lend itself to being light as a feather by nature. It's pretty well balanced, though. Both are cleanly made, the welds on the basket are practically invisible and the polish is a smooth satin finish. One very unfortunate issue to be resolved (hopefully) soon exists, though: The hilt and pommel of the long sword don't line up properly with the blade - I suspect the tang to be bent. If it happened during shipping or went unnoticed during assembly, photoshoot and packing is not really of any consequence, but I do hope I'll get it back soon. There are many attractive Danelli swords. I'd like to get his Sidesword Schiavona (aka German baskethilt) and his Type XIX sword with finger ring.